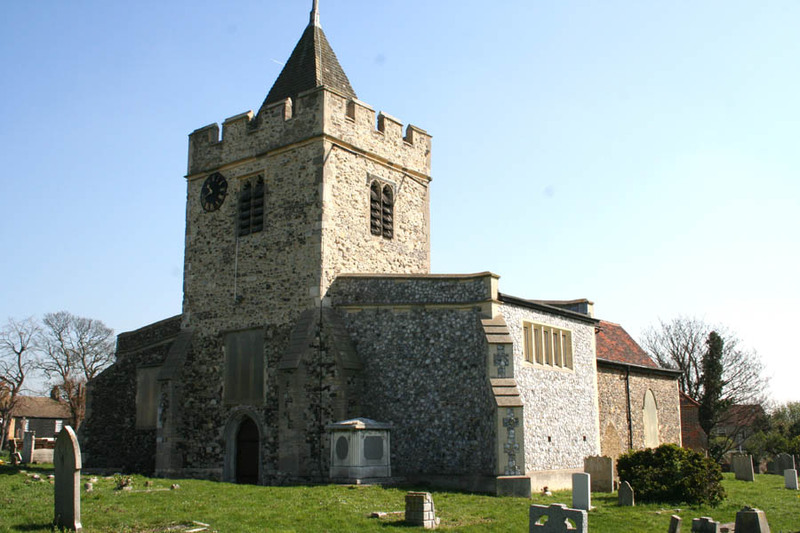 On 14th June 2000 members of the Society visited St. Michael's Church, Aveley. This Norman church was built about 1120, and then consisted only of a nave and small chancel. Parts of this early structure still survive in today's church and re-used Roman tiles can be found in the walls. The earliest known rector was one Galfridus de Friscobaldis in 1311. The members were shown round by John Knight, the Church Treasurer, and were pleasantly surprised by the wonderful interior and the history that it holds. The following description follows that guided tour. Entering the church through the 15th century porch a visitor first notices that the arcade between the nave and the south aisle, which dates from 1160 with its round Norman arches, differs from the later pointed Early English arches between the north aisle and the nave. The original church had a semi-circular chancel which is now enlarged and rectangular. The new chancel, tower and north walls date from 1220-1260. Turning to your left note the unusual square 12th century font of Purbeck marble. Further along on the left, through the north aisle to the north chapel is the original altar, adorned by paintings by Sir Charles Holroyd, a Director of the National Gallery. The present main altar dates from 1952. Also in the north chapel there is a brass with a join down the middle (now covered by carpet). This brass is to Charles Barett son and heir of Edward Barette. In 1856 a gentleman visiting the church to do brass rubbing noticed that half of this brass had been broken off and was missing. Twenty years later during the building of a workshop in Romford the lost portion was dug up and entrusted to a Mr. Kennedy. He found out that the fragment came from Aveley and shortly thereafter two clergymen from Romford, with his permission, took his half to St. Michael's where they found the other half still in situ and tore it up. Mr. Kennedy protested at this act of wanton vandalism and gave his half to Colchester Museum on condition that it remained there until arrangements could be made to re-fix it in its original position. Eventually the second half came into possession of the Vicar of Aveley in 1907 when both parts were replaced in the chapel floor. The Jacobean carved chair (of about 1620) in the chancel came from Belhus and is decorated with the Dacre knots. The painting of the Crucifixion is reputed to be by a pupil of Rubens and was given to the church by Baroness Dacre. 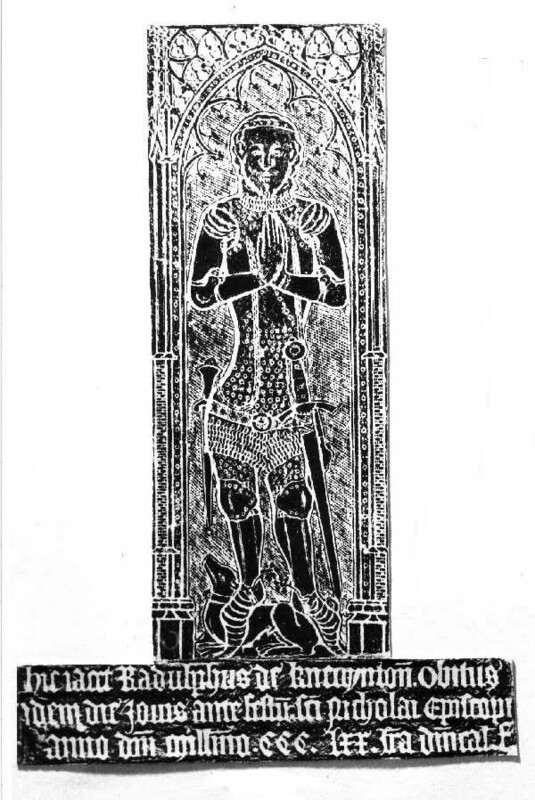 The famous small brass of Radulphus de Knevynton (the Knight of Aveley) is located just to the right of the altar, now covered by carpet, and was placed there in 1370. The large tomb let into the sanctuary is probably that of Isolda de Belhus; brasses of herself and her husband disappeared long ago but those of her six sons and two daughters remain. Edward Barrett, Lord Newburgh lies in a vault under the high altar. There is a wonderful carved Jacobean pulpit which is dated 1621 with hexagonal sounding board. Another tomb under the pulpit is said to be that of Nicholas de Belhus. The wooden chancel screen dating from approximately 1440 was moved to the west end of the nave in the 20th century.